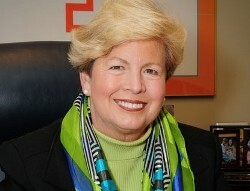 Joan Cronan, the Academy’s 2011 Carl Maddox Sports Management Award winner. For the past 28 years, Joan Cronan has led the women’s athletic programs at the University of Tennessee and now she is playing a major role in the school’s sports future as the interim vice chancellor and athletic director for both men’s and women’s athletics. Cronan is the first woman in Southeastern Conference history to oversee an entire athletics department. Because of that and her long record of success, she earned the United States Sports Academy’s 2011 Carl Maddox Sports Management Award. The award, named in honor of the former Athletic Director of Louisiana State University and Mississippi State University, is given annually to an individual for his or her contributions to the growth and development of sport enterprise through effective management practices. The individual should exhibit mastery of all the management functions, be well known in the sport arena, and have an abiding belief in the need for ethical behavior in sport management. “The University of Tennessee is fortunate to have Joan Cronan in such a pivotal leadership role in our athletics department. She is a perfect example of what the Maddox Sports Management Award is all about because she does things the right way,” said UT Chancellor Dr. Jimmy Cheek. Under Cronan’s direction since 1983, the Lady Vols program has won 10 national titles, 50 combined Southeastern Conference regular-season and tournament championships, and captured the SEC’s women’s all-sport award from the New York Times for three consecutive years. Currently, Cronan is Tennessee’s interim vice chancellor and interim athletic director. She was named to the position June 9 and will help oversee the consolidation of the men’s and women’s athletic departments and assist in hiring a new athletic director. Her first duty in the combined role was the pivotal hiring of new UT head baseball coach Dave Serrano on June 16. “My job as an athletic director has always been to look at how you make the coaches’ job the best it can be, to make the student-athletes’ experience the best it can be and to make the university be represented with class,” Cronan said. Cronan, who served on the Academy’s Board of Trustees, has been honored frequently over the years. Tennessee’s success in both the athletic and academic realms speaks volumes to her decision-making and leadership ability, as demonstrated by her appointment to the 2010 NCAA Division I Leadership Council and selected by her peers as the president of the National Association of Collegiate Directors of Athletics (NACDA) in 2008-09. Cronan is also a former president of the National Association of Collegiate Women Athletics Administrators (NACWAA). Both organizations have also honored Cronan as well. She was selected by NACWAA to receive its 2005 Athletic Director of the Year award. In 2004, Cronan was honored by NACDA with its Southeast Region Athletic Director of the Year award. She was presented with the Women of Achievement Award: “Women Who Make a Difference” by the International Women’s Forum. Cronan has been enshrined in the Tennessee Sports Hall of Fame (2008); FCA Hall of Champions (2003); the Knoxville Sports Hall of Fame (1998); the LSU Alumni Hall of Distinction (1995) and the College of Charleston Hall of Fame (1990).